Add some mindfulness to story time with this selection of books, written to help kids appreciate their world from the inside out. When I was a kid back in the eighties, we had lots of cool books. We had Clifford the Big Red Dog, Curious George, and The Berenstain Bears. There were countless stories with morals and endearing, memorable characters, but I can’t recall a single example that suggested mindfulness: awareness of breath, conscious self-talk, slowing down the moments, tapping into the senses as a way to come into the present moment for ourselves as well as for others. 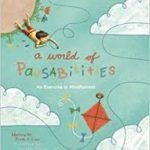 Today, the number of well-written, thought-provoking children’s picture books with a mindful component is growing by the moment. Adding a mindful book or two to the current cannon of bedtime stories feels like adding an extra nutrient to the meal. We are planting seeds of empowerment in our youngsters to grow into young adults who can appreciate their world from the inside out. Adding a mindful book or two to the current cannon of bedtime stories feels like adding an extra nutrient to the meal. 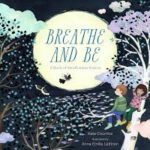 I pulled together seven mindfulness-based illustrated children’s books published over the last year that are worthy of a closer look. I lugged them around in a canvas bag on a road trip with my eight-year-old and two-year-old daughters, who were more than happy to add their insights and judgments. 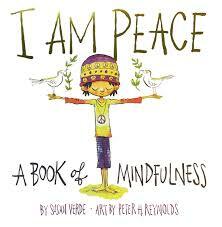 We gave them each multiple read-throughs in a range of places, times and environments, allowing the message of mindfulness to sink in deeply, and giving the books more than one chance to impress us. Here’s what we discovered. A World of Pausabilities pulls us into a neighborhood on a summer day that could be any neighborhood on any day. 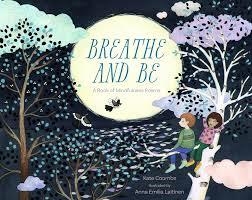 There, we see both children and adults applying mindfulness to everyday moments by taking a pause. The illustrations are crisp and active, depicting all sorts of people delving into the richness of moments like eating an apple and taking a slow, silent walk. The words rhyme, child-like in their simplicity. 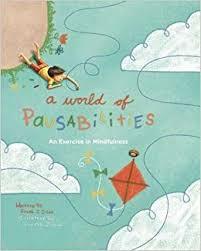 After reading this book, I started noticing pausabilities all over the place in my world—little bursts of extra mindfulness while brushing my teeth and walking the dog. 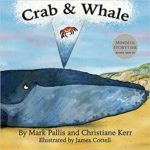 Crab and Whale tells us the simple story of a crab that helps a whale make it through a tough day by using calming breathing and encouraging awareness of his senses. 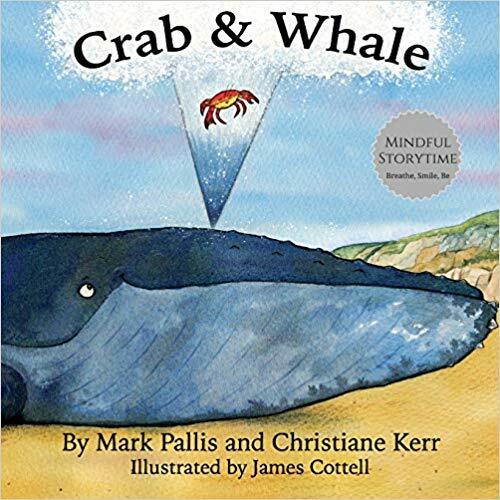 When the whale is washed up onto the shore, the crab tells him, “I’ll stay with you until the tide comes in.” I was touched by this gesture, and the profound significance of staying withour loved ones when they are going through a hard time. 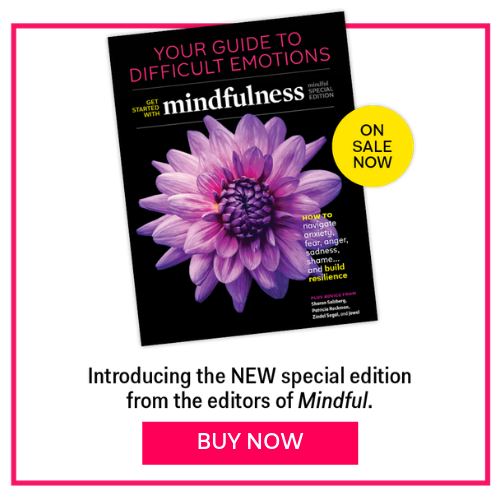 Readers will find this tiny tale helpful in that it shows how mindfulness can be an offering not only to ourselves, but to others when they may need it most. 30 Mindful Moments to Help Kids to Feel Calm and Focused Anytime, Anywhere. 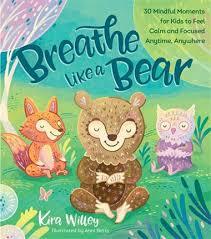 Author Kira Willey is a children’s music and yoga expert. 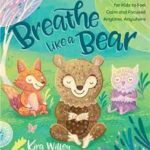 You can feel her wide-awake energy in the pages of Breathe Like a Bear. Thirty bite-sized mini-meditations—with names such as “Candle Breath” and “Wake Up Your Face”—are accompanied by fanciful, super-inviting animal images. The author has sectioned off the meditations by energy: “Be Calm,” “Focus,” “Imagine,” “Make Some Energy,” and “Relax.” But I could easily see this as being a family-friendly coffee table book that adults and children alike can pick up, open to any random page, do the tiny practice and be a just a bit more mindful and centered because of it. The half-wall next to my eight-year-old daughter’s desk is filled with post-it notes marked with mis-spelled positive affirmations: “you got ths” and “you r luvd,” they say. 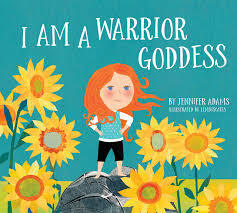 I could easily sneak one in there that says, “I m a worior godiss.” The book, I Am a Warrior Goddess feels as simple as a collection of pages of encouraging self-talk for my daughters. 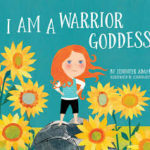 The illustrations are fun and lively, telling us the story of a sweet little redhead who talks to herself wisely and affirmatively— the way we are teaching our young girls to speak to themselves. 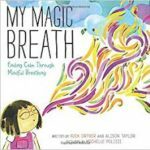 My Magic Breath is a colorful manual on how to use breath as a tool that can be practiced alongside specific visualizations in order to work with negative, unwelcomed thoughts. Personally, I’m not a fan of the notion that we need to blow sad thoughts completely “off the page,” as I believe there is a place for them in the holistic narrative as well. But, using breath with positive imagery is a very effective way to create space in the psyche for more pleasant thoughts. My two-year-old—who adores blowing out fake birthday candles—really resonated with this one. 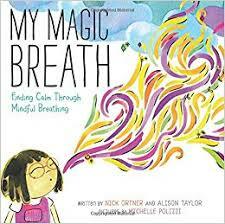 Regardless of the specifics, I’m a big fan of bringing awareness to the breath, as this book most certainly does. *Indicates that the book includes a guided meditation.